I'm not a huge celery person. 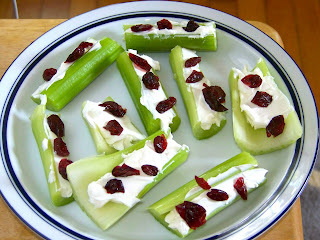 I really don't like cooked celery and I only like raw celery in certain dishes. Regular ants on a log sometimes feel heavy to me and I'm not always in the mood for raisins so I decided to try a little twist on this classic to freshen it up a bit. I replaced the peanut butter with low fat cream cheese and replaced the rasins with crasins. This version has significantly less calories than regular ants on the log and has a whole different flavor which is perfect for hot days!